Review: Everyone remembers how the 2011 season ended for the 49ers, but it's all a bit of a blur exactly where it started. Had you told Kyle Williams at the start of the season he would be the pivotal man in NFC Championship game, he, let alone many millions of others, probably wouldn't have believed you. Once he'd fumbled the football twice on punt returns in the 4th quarter and then over time, allowing the Giants to first score a go-ahead TD and then a game winning FG, he'd have wished you were lying. Still, making it to a single score from the Superbowl is nothing to be ashamed of at all the 49ers, and an impressive 13-3 season that came out of nowhere leaves the fanbase and the franchise re-energized, and galvanized behind their star men. Biggest Strength: The defence. And oh boy, is it a defence. 4th in the league in YPG, 2nd in PointsPG, 1st in forced fumbles, and they didn't concede a single rushing TD vs anyone in the first 14 weeks of the season! When you look at their personnel, it's not hard to understand why. A rock at the heart of their D is Patrick Willis, undoubtedly the best linebacker in the NFL right now, and alongside him emerging superstar NaVorro Bowman. As if having 2 inside linebackers that featured in the TPL100 wasn't enough, just in front of them is one of the best defensive linemen in the business, Justin Smith, who himself came 8th in our preseason player ranking. They're also no slouches in defending against the passing game either, with 23 interceptions and 42 sacks in 2011, teams really struggled to find any way to break them down. Biggest Weakness: Alex Smith. No surprise here really, but the former #1 overall selected quarterback is still the biggest question hanging over this team's head. 2011 represented a great improvement for Smith compared to previous years, starting all 16 games for the first time since 2006, and gaining career highs in yards, completion % and QB rating. He also threw a career low 5 interceptions, balanced with 17 TDs. But, even with all the taken into account, Smith is still the weak link of this team. Whilst 2011 represented an upturn in his fortunes, it can only really be credited to Jim Harbaugh's intelligent use of the QB - he didn't ask Smith to do too much, he made sure that his roles were to "game manage" (as much as I hate that phrase) and direct the offence rather than star in it, and it was all helped out by the fact that their defence was able to keep them ahead in games, regardless of how their offence was competing. Their traditionally strong running game, on the shoulders of Frank Gore, was a lowly 26th in YPG last year, and the passing offense with some people's "breakout performer of the year", Smith, at the helm, was 29th. Hardly what you would expect from a team that was so close to making it to the big one with a chance to win it all. To give Smith a bit of a break, he wasn't working with the greatest receiving corp in 2011. Vernon Davis is a perennial pro-bowler at TE, but aside from him Michael Crabtree has been a massive letdown, and no other receiver was able to record more than 20 receptions in the entire season (Williams -20, Ginn -19, Walker -19). 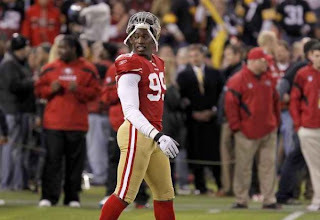 In attempt to give the offence a few more aerial weapons, the 9ers picked AJ Jenkins at the bottom of the first round in the 2012 draft, as well as adding veterans Randy Moss and Mario Manningham in free agency. The stories of these three have been very mixed coming out of camp, with Jenkins purportedly well behind the curve, but until we get into regular season action it'll be hard to fully evaluate where each of these players are and how well this offence can fit together. Keep an Eye On: Aldon Smith. The outside linebacker was just half a sack short of equalling the NFL rookie record of 14.5 sacks in a season in 2011, and looks set to continue his excellent beginnings with a more in depth role in the defence in 2012. It's scary to look at the stats he recorded when you bare in mind he was nothing more than a situational player for more of the year - just think what he'll do if he's on the field for twice as many snaps... Of course, Smith did actually get stabbed during the off-season, but a little thing like that isn't going to stop him. Prediction for 2012: In this division, there is little to challenge them. 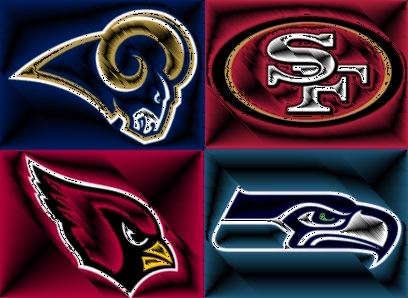 Expect the 9ers to retain the NFC West title with a couple of games to spare, allowing them to focus on the post-season. With Alex Smith still under centre, however, they're yet to find the complete package required to go all the way to Superbowl victory. Review: The 2011 season was one filled with hope for the Arizona Cardinals. A disappointing 5-11 showing in 2010 was due in no small part to their failure to fill the void left by Kurt Warner's departure, so with the preseason trade for former Eagles QB Kevin Kolb, it was all supposed to get a whole lot better. Combined with the addition of CB Patrick Peterson, arguably the most talented individual in the entire 2011 draft, many were tipping Arizona for a potential NFC West crown and playoff football. That was until they actually started playing. A win in week 1 over the Cam Newton led Carolina Panthers was a good start for the team, despite allowing over 400 passing yards to the rookie, they were able to scrape to victory, with Kolb throwing 309 yards of his own and 2 TDs. From that point though, it was all down hill. 6 defeats in a row followed, and although many of the scorelines were close, they never did enough to win. By week 8, with a 1-6 record, the Kevin Kolb honeymoon period was definitely over, as the QB had recorded just 8 TDs to accompany 8 INTs and 7 fumbles (3 lost). The reigns were handed back over to John Skelton, who led the Cards on somewhat of a comeback, starting with an OT victory vs the Rams (thanks to a spectacular punt return from Peterson) and resulting in a .500 record at the end of week 15 (7-7) - a streak which included 6 wins including victories over the Eagles, Cowboys and 49ers, and just one loss (also to the 9ers). By this time, however, it was too late for the team to really challenge for a playoff spot, and a final day win over the Seahawks was enough to secure 2nd place in the division but nothing more. Biggest Strength: The receivers, led by Larry Fitzgerald. One of the most spectacular WRs in the game, and a huge focal point for the Cardinals offence, Fitzgerald has the ability to be a game-changer even when the quarterback throwing the ball to him seems to have little/no clue what he's doing. Not only this, but he's a true franchise guy, always trying to do (and calling for) what he thinks is best for the team to succeed, and not complaining when things don't go his way. Admittedly, he's always going to get plenty of targets in the Cardinals offence with a skill set like his, and he'll hope to improve on his 80 receptions and 8 TDs from a year ago. To attempt to draw some of the coverage away from Larry, the Cardinals drafted Notre Dame's Michael Floyd in the first round of the 2012 draft. Floyd was a riser in the lead up to the draft, and by the time the first round started he was being touted as potentially the best receiver in the draft. Taken at #13, many, including myself, criticized the Cardinals for addressing an area of want rather than one of their many areas of need, but if Floyd can help whichever QB is under centre in Arizona succeed where others have failed then the pick won't have been wasted. Biggest Weakness: The rest of their offence. Sadly for Larry Fitz, there's very little else on the offensive side of the ball for Arizona fans to smile about. The preseason has been nightmarish for the QB situation, with Kevin Kolb now looking like a complete swing-and-a-miss of a trade, and Skelton the presumed starter yet again. Whilst this is a bad enough situation, it doesn't really compare to the issues the Cardinals have on their offensive line. Levi Brown was a bust at LT before the preseason got underway, but the former #5 overall pick went one better and managed to tear a tricep, landing him on IR and making him even less use to the franchise. Sadly for the Cardinals, aside from OGs Darren Colledge and Adam Snyder, the rest of their OL doesn't look much better. Rookie Bobbie Massie will be forced to start at RT, and come up against some formidable pass-rushers early on with the Patriots in week 2 and the Eagles in week 3. Levi Brown's replacement at tackle will be D'Anthony Batiste, a 7-year vet with only 20 games and 4 starts to his name. Lyle Sendlein returns at C, and will help to ensure some continuity on the interior of the OL, but on the outside there's nothing but trouble coming for whichever poor soul finds themselves dropping back and hoping to get ball off before losing their heads. Can Peterson win more games in 2012? Keep an Eye On: The defensive secondary. This team does have some talent there, an it may well be needed if their offence is struggling as many expect them to. Patrick Peterson was a star both at CB and in the return game in 2011, and with second round rookie Jamell Fleming joining him and Adrian Wilson in the secondary, this team may be able to force quite a few turnovers, especially if O'Brien Schofield continues to develop well as an outside pass rushing threat. Prediction for 2012: Unless the Cardinals can find some sort of stability behind that OL (which is a very big ask), this season doesn't look rosy for Zona. Their defence may keep them in a few games, but without anyone to get Larry Fitz the ball, they're going to struggle scoring points. No doubt PP will score some more return TDs, but this is hardly a sustainable model for offensive football. 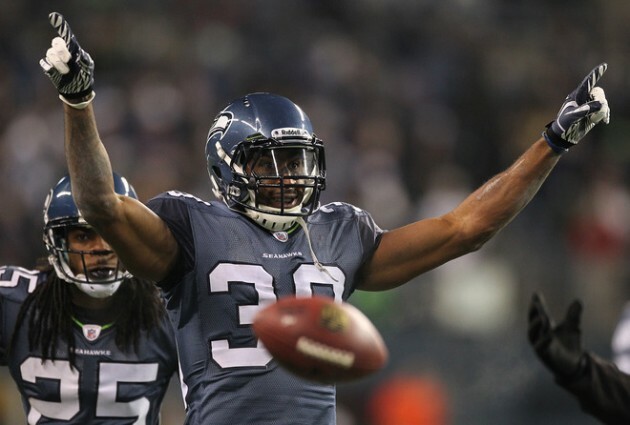 Review: 2011 was a tale of uncertainty right from the start for Seattle. 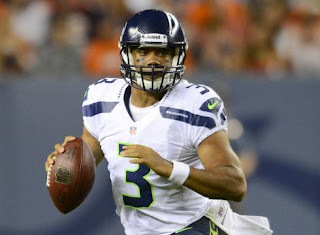 It was the first season since 2001 that Matt Hassekbeck hadn't been at least in the fight for starting QB, and instead the Seahawks were set up with 2 career backups in Tarvaris Jackson and Charlie "Clipboard Jesus" Whitehurst under centre to try and help them repeat their division winning feat of 2010, but looking to improve on their record of 7-9. 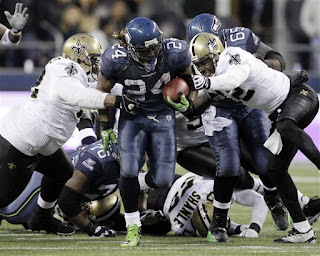 Of course, the Seahawks were still riding high on the crest of their shock victory over the Saints in the Wild Card round and Marshawn Lynch's "Beast Mode" performance, so even with a degree of the unknown about them, many fancied Seattle to retain their title. Unfortunately for the 12th man, their season was all but over by week 9. A difficult opening schedule, combined with terrible losses like the 6-3 defeat at the hands of the Browns meant that Seattle slumped to 2-6 and were only kept off bottom of the division by the fact that the Rams and Cardinals were both playing atrociously too. Whatever mode Lynch was in to begin the season, it wasn't Beast. Maybe his delivery of skittles didn't arrive until the Hawks went to Dallas. Either way, the man relied on to be a driving force for Seattle had managed only 264 yards in 6 appearances, and only 3 TDs. Tarvaris Jackson, eventual winner of the QB battle, was playing admirably but no better than expected, and he couldn't be relied on to win games by himself. It was in Dallas that things started to turn. Lynch recorded 135 yards on 23 carries plus a TD, and it signalled his revitalisation, rushing for 941 yards over the final 9 weeks of the season, leading the league, and contributing a further 9 TDs to go with it. His performances clawed Seattle back to 7-7, with a chance to still go to the post-season, but close losses to divisional rivals the 9ers and Cardinals in weeks 16 and 17 put pay to their season and left the 3rd in the division. Biggest Strength: This is a hard one for me to pick, because the Seahawks actually have a number of very strong areas. Marshawn Lynch, on his day, is excellent. But as the first half of 2011 showed, his day might take 9 weeks to arrive. Their offensive line is also a great prospect, with youth across the board and high draft picks invested in the likes of Russell Okung, James Carpenter and John Moffitt, the unit looks as though it may be formidable for years to come. In the end, however, my nod goes to the defensive secondary. The names Brandon Browner, Richard Sherman, Marcus Trufant, Kam Chancellor and Earl Thomas may not all be household names, but they really should be. You'd be hard pressed to find a single team in the NFL with the quality Seattle have here. Sherman and Browner are BIG corners, Thomas has 7 INTs in just 2 years in the league, and Chancellor, who had 4 picks himself last season, hits like a train. Provided the Hawks front 7 doesn't leave these guys too exposed on the back end, they should be able to shut down significant areas of the field when opposition Os look to the air. Biggest Weakness: Their receivers. I resisted the temptation to say their kit designer here, but only on the basis that their wideouts are a pretty awful looking bunch. When fit, Sidney Rice can be a #1 receiver in the league, but the "when fit" caveat is a fairly significant one when you consider he had double shoulder surgery this off season. They brought in both TO and Braylon Edwards off the street to try and help out, and whilst Edwards has survived the cuts so far, TO is already back in the unemployment line. Having already named a rookie QB as their week 1 starter, the Seahawks really need to hope that Doug Baldwin continues to emerge as a viable option, otherwise there could be some issues for this offense scoring when Lynch is taking a day off. Keep an Eye On: Russell Wilson. The third round pick from Wisconsin via NC State has won the starting QB over Matt Flynn thanks to his outstanding preseason performances. Upon arrival, Wilson was barely thought of as the 3rd stringer, with a reasonably successful incumbent in Tarvaris and a big splash acquisition in Flynn above him on the chart. Fast forward 4 months and Wilson has not only beaten out Jackson to the extent he was expendable and traded to the Bills, but also put Matt Flynn back into the backup role he left Green Bay to get away from. Coming out of college the only real negative levelled at Wilson was his height. How could a 5'11 QB really succeed in the NFL behind 6'5 offensive linemen with physical freaks at DE baring down on him? Pretty well it seems. Stand Wilson next to Drew Brees and there won't be much difference in height at all. Seahawks fans will be hoping come the end of the season that Wilson and Brees will be mentioned in the same breath for many other reasons too. Prediction for 2012: This team looks better than 7-9 to me, but only if someone can emerge at receiver. With a decent pair of WRs, this team could challenge the 49ers for the division, and who knows, maybe take a big scalp in the post-season too. As it stands, however, they're looking to rely on Wilson to make the plays in the air, which as good as he's been so far, is a lot to ask of a rookie QB. A run of games like Lynch had to finish 2011 will certainly help their offense significantly, and with a bit of look, a final line above .500 looks very attainable. Review: 2011 was a season Rams fans will all want to forget. After missing out on the playoffs so narrowly in 2010, there were high hopes entering the year, with QB Sam Bradford looking to build on a very decent rookie campaign. The reward for finishing second in the division, however, was an absolute monster of an opening schedule, touted almost universally as the most difficult in the league, and looking, at most, like there might be 2 wins amongst the first 8 games. It started so, so well. On their first play from scrimmage week 1 vs the Eagles, Steven Jackson took the ball 53 yards for a TD that made every one of the fans believe in the team. It was pretty much downhill from that point on. Jackson injured his quad, slot receiver and Bradford security blanket Danny Amendola dislocated his elbow, the already weak offensive line sustained injury after injury, and eventually so did Bradford. Having not missed a single snap his entire rookie season, Bradford was only able to start 10 games, and even when he was on the field, the constant, and I mean constant pressure that came from no protection, combined with the lack of any receiving threat meant he could only contribute 6 passing TDs the whole season. The offense that was supposed to break out with Josh McDaniels running the show just broke down, and the Rams collapsed to a 2-14 record with their only wins coming thanks to a 13-12 win over the Browns (when a botched Ryan Pontbriand long-snap in the final minutes denied the Browns a go-ahead score) and a quite frankly astounding 31-21 win over the high-flying Saints. Biggest Strength: This is not a hard selection to make. 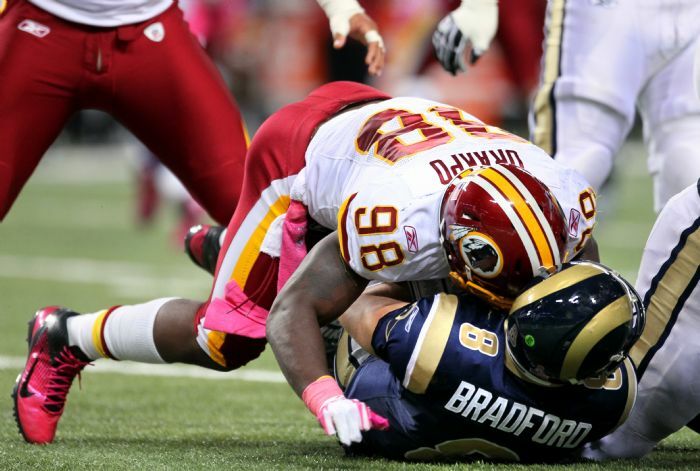 The defensive line is a real area of strength for the Rams almost across the board. 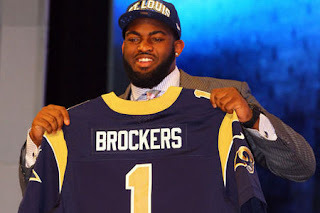 It now boasts three 1st round picks amongst it's numbers: Chris Long, Robert Quinn, and Michael Brockers, with free agent acquisition and himself a former 3rd round pick by the Miami Dolphins Kendall Langford rounding out the starting unit. Despite a less than stellar preseason so far for the Rams, this unit has looked dangerous; constantly putting opposition QBs under pressure, driving offensive linemen back into the pocket (particularly against the Cowboys first team unit this past week), and giving the Rams something they've lacked in a very long time: the potential to be able to stop the run. The problem for this unit will be the pressure on them to perform. The linebacking corp behind them is improved, but still lacking, and with a rookie CB starting for the Rams the front 4 will need to keep QBs honest, or they'll have all day to exploit the holes in the secondary. Biggest Weakness: It's a real toss up between receivers and O-line for this section. Both are not good, but the nod has to go to the line. Former #2 overall pick Jason Smith is a bust, and by the end of Wednesday will be a New York Jet. He was lost again for much of 2011 with another concussion, and had already been beaten out by Barry Richardson (which is a statement in itself) this preseason. At LT, Rodger Saffold looked good as a rookie, but looked out of place last year. Fortunately for him, there is basically no one else on the roster that comes close to challenging for his place, so he'll get the start. There are problems inside too. Free agent acquisition Scott Wells brings experience and talent to the C position vacated by Jason Brown/Tony Wragge, but he's missed the majority of the preseason with a knee injury and so has little continuity with the rest of the unit. Easily the best player on the OL, guard Harvey Dahl is now out too with an infection, and will almost certainly not be back before week 1. That leaves the remaining LG position played by, ummm, well that's kind of the point. The Rams don't have another top level OG on the roster. They waited until the 5th round of the draft to add Rokevious Watkins, passing on a number of highly rated guards throughout rounds 2 and 3. Watkins has played reasonably with the second team unit so far, but should never be relied upon to start in week 1 having played so little time with the 1s. That role has been with Quinn Ojinaka, but with only 15 starts in 6 years in the league to his name (most of those at tackle), and mediocre performances at best this year how the Rams expect to succeed is beyond me. This unit, unless it improves quickly and drastically, will be the reason that Rams lose double digit games again in 2012. Greg "The Leg". Also pictured, his other leg. 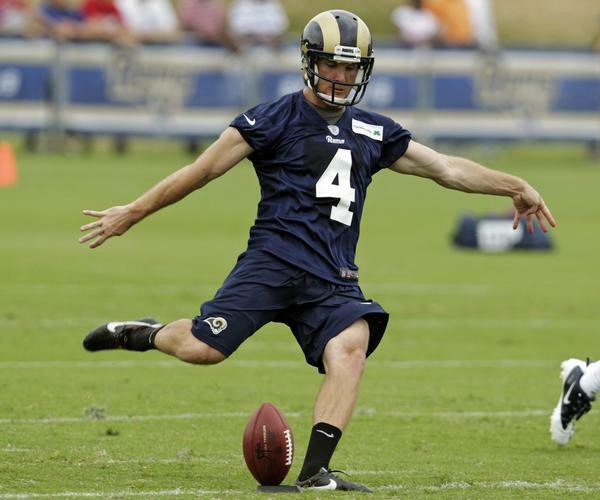 Keep an Eye On: Greg "The Leg" Zuerlein. Yes, I'm genuinely picking a kicker as my one to watch here. As a college senior at Missouri Western he set an NCAA record of 21 consecutive successful kicks for 50+ yards, and also completed 2 FGs of 58 yards in a single game. As soon as the Rams drafted him they cut incumbent Josh Brown, and Zuerlein has already eased through the "battle" in camp against Garrett Lindholm, so looked for him to be a regular fixture on special teams. When the offence is struggling this season, look for them to just aim to make it beyond the oppositions 45 yard line, then just give the ball to Greg and see what he can do. Prediction for 2012: Trouble. The defence should be a big improvement from 2011, but the offense may not be. Going from Josh McDaniels to Brian Schottenheimer at OC is an out of the frying pan, into the fire kinda deal, and unless the OL improves significantly, the 5 and 7 step drops Schotty will want to have Sam running will quickly become "2 steps then dropped". If the Rams reach 5-11 I will be content. If they don't, I won't be surprised.